Lets start with the sword arm. Like the left arm, I started by painting all of the shadows with the arm off of the model and then glued it on. From there, I decided to start working on the blade, instead of the highlighted areas of the arm. I wasn't sure what to do with the blade, but once again Chris chimed in with a suggestion of base coating it blue. He also suggested doing full NMM on it, but I already had gone TMM on other sections and NMM isn't something I'm comfortable with, I decided against it. Instead I chose to paint the TMM on the blade in a manner similar to how NMM is painted. I've been working on improving my metallics so far this year and I feel like I've gotten them to a good place for metal bits and armor plating, but one thing that has always intimidated me was painting blades. 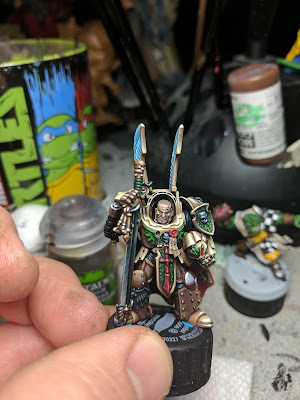 The blade was base coated with Necron Abyss and black mixed about 2:1. This covered the whole blade and from there I started mixing in Leadbelcher in small quantities. I tried to keep it dark, so the metallics didn't overpower the mini. One thing I decided to try out was doing reflections on the blade. I've never done this before, but thought it would be a neat idea and set off the sword a bit more. 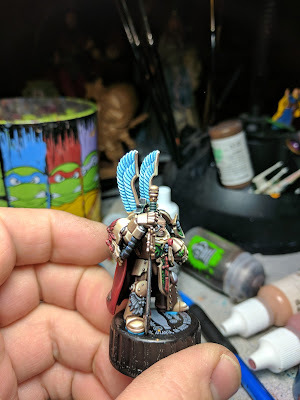 So I took a bit of bone, green and red and glazed it as best as I could on parts of the blade to act as the reflections. I think it looks pretty solid and gives the blade a bit more interest. This guy's head is actually not from the Deathwing kit, instead it is from the Kill Team box set. After a bit of work to get it to fit the socket correctly, I drilled it for a pin and glued it to the end of an old paint brush. 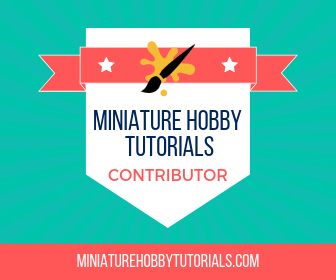 I started out with a base coat of Tanned Shadow from Reaper's MSP line. 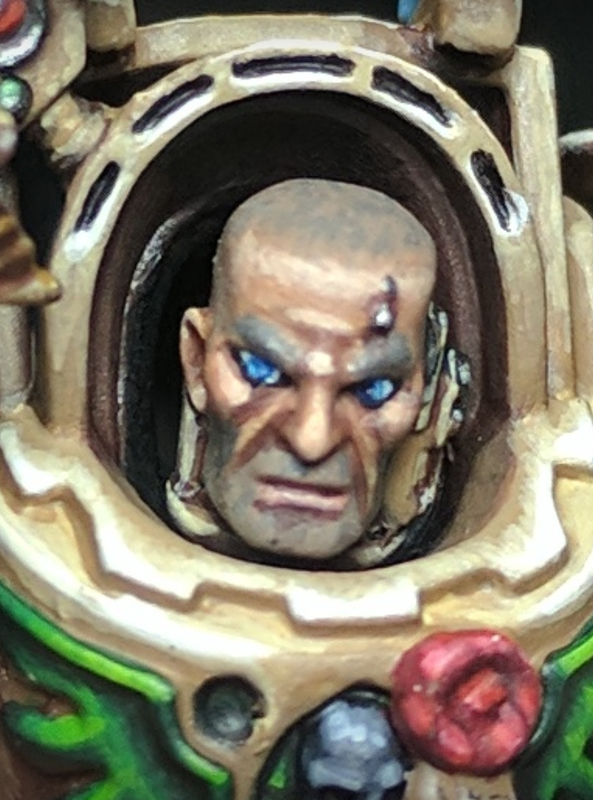 Before shading and highlighting started I mixed Tanned Shadow with Citadel's Riekland Fleshshade for the cheeks and ears and glazed it over those areas. 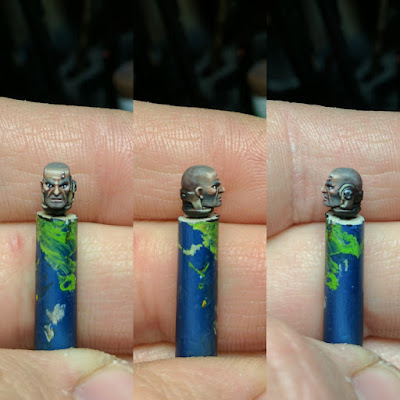 I then mixed Tanned Shadow with Drakenhof Nightshade and glazed it over the shadowed areas, such as the back of the head, the eye sockets and under the chin. Fair Skin to highlight it up. All the while, reglazing the blushing and shadow areas to keep the color from getting washed out. Once the head was all set, I decided he needed a stubble beard and hair. So I mixed Tanned Skin with Vallejo Neutral Grey and glazed those areas. I then stippled a darker mix of Tanned Skin and Neutral Grey onto them, before reglazing with the original mix again. After some touch ups to the hair line, he looked great! I'm super happy with it and it is definitely the best face/head I've ever painted. The only thing I wasn't 100% on were the eyes, but those ended up getting redone a few days later. The last parts of the model to finish were the exterior of the cape and the wings above his shoulders. 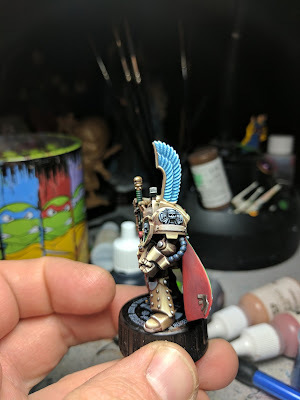 The wings were painted in the same manner as the rest of the armor and it was an interesting challenge. I needed to limit contrast, so they didn't draw away from the face, but they also needed to be bright enough to make the highlighting seem believable. The feathers of the wings were painted with a mix of Lothern Blue and White. I wanted to keep the blue tone as light as possible. In the pictures the blue tone looks way more vibrant than in person, probably because of the lamp light. Actually after I painted the wings, that is when I decided to redo the eyes and used left over blue mixes from that to repaint them. At first I tried to do pupils in the eyes, but they looked on. So I redid it again, this time without. They look a lot better than just plain dots, for sure. 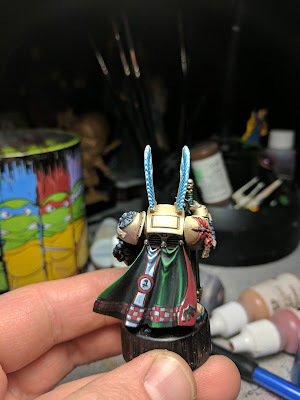 The cape was freehanded. 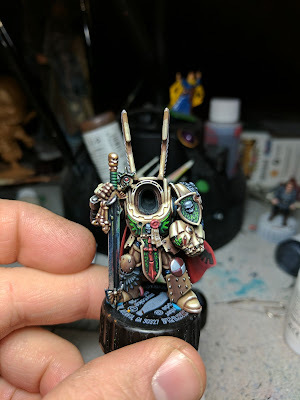 I don't do a lot of freehand work, so I feel it is the weakest part of the entire mini. I am pretty happy with the variation from dark to light in the shadows and highlights. But the texture of the cape made it difficult to get straight lines. Lets take a look at him, shall we? Overall, I'm pretty pleased with how he's turned out. 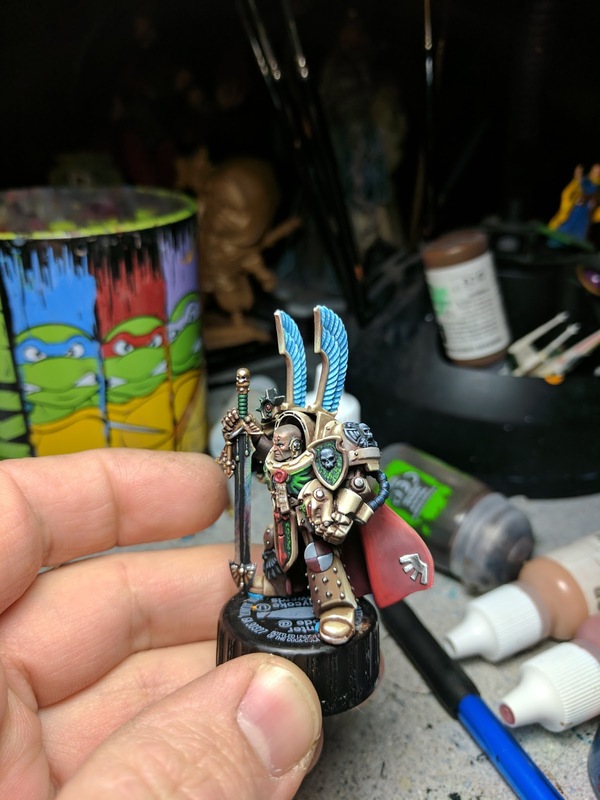 I just need to go over the whole thing once more and check for touch ups on him and figure out wording for the shoulder scroll. But for now I've moved on to his base, more on that later.